I didn't much care for Susan Hayward's acting style when I initially saw this film. But I've watched many of her films since, PEPLUM or not, and I've changed my mind for this role. She's pretty good. Yes, her tics and mannerisms are present, which are needlessly distracting, but I now appreciate her take on Messalina. She could have been more cruel but that's how Messalina was written for this film. Barry Jones' British accent in a film with a mostly American cast is also quite distracting. Good film. Much more PEPLUM-like than its predecessor, THE ROBE. In fact, this is one of the best PEPLUM films made in Hollywood. 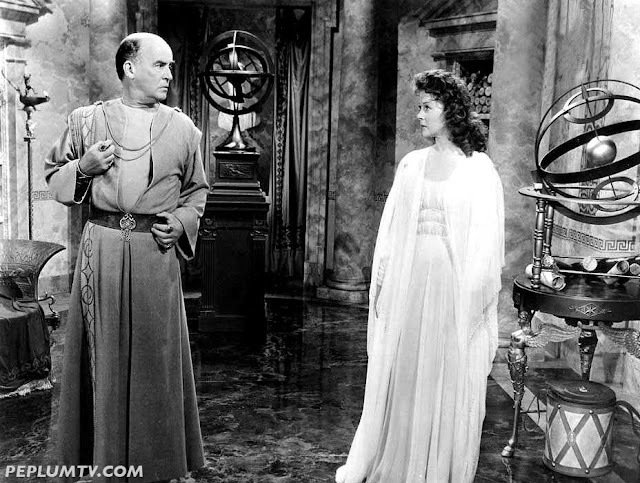 I agree that DEMETRIUS AND THE GLADIATORS is better than THE ROBE, primarily because it has less syrupy early 1950s style Christianity. The early 1950s saw a religious revival in the US, driven by an exaggerated fear of both domestic communism and the threat from the Soviet Union. Ironically, at that time the USSR had no way of hitting the US with its nuclear weapons, while the much more secular Western Europe was indeed very exposed. The slogan quote the family that prays together stays together unquote tells us a lot about the mindset of the early Eisenhower era. I won't comment on the accuracy of Claudius (or Caligula, for that matter), but Messalina would have been in her 20s, which would have been a bit of a different picture. Another one of my favorite movies. Epic in scope with great arena scenes. Mature, Hayward, and Robinson were very good in this movie and the soundtrack was outstanding. While I'm here I like to say that I saw GORDON THE BLACK PIRATE on my Amazon Prime and it was pretty good even though it was in Italian with English Subtitles. I also watched SEVEN REBEL GLADIATORS, and INVINCIBLE MASKED RIDER both were in Italian with English Subtitles and still very entertaining and the prints were excellent.